Note: Last year he broke his maiden at Calder in July then shipped to Belmont where he won the Champagne Stakes (G1). Skipped the Breeders' Cup and went in the Remsen (G2) where he disappointed in 5th. 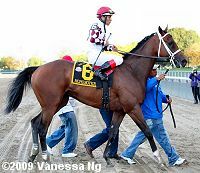 In his 2010 debut, disappointed in 5th in the Holy Bull (G3) at Gulfstream on January 23, followed by a second place finish in a 1 mile allowance race at Gulfstream on February 27. Did not start again until the Kentucky Derby where he was 16th beaten 53 3/4 lengths.